... parents ... who were great Calvinists (but withall very pious and good ones). ... even in my earliest childhood, an inward sense of the Divine Presence was so strong upon my mind, that I did then believe, there could be no deed, word, or thought hidden from Him. After attending Grantham Free School (the Grammar School), More was sent to Eton when he was fourteen years old. Here he came to change his religious views, rejecting Calvinism which had the notion of predestination as a metaphysical necessity and the basis of faith. More came to the belief, which he held strongly throughout his life, that salvation was possible though goodness. During this time his father had put his upbringing in the hands of an uncle who tried to prevent the young More from being so forward by flogging him to try to make him return to the Calvinist ideas about free-will. Flogging certainly did nothing to return More to Calvinism, perhaps it had just the opposite effect. [I plunged] over head and ears in the study of philosophy; promising a most wonderful happiness to myself in it. Aristotle, therefore, Cardan, Julius Scaliger and other philosophers of the greatest note I very diligently pursued. In which the truth is, that I met here and there with some things wittily and acutely and sometimes also solidly spoken: yet the most seemed to me either false or uncertain, or else so obvious and trivial, that I look upon myself as having plainly lost my time in reading such authors. And to speak all in a word, those almost whole four years which I spent on studies of this kind ... ended in nothing, in a manner, but mere scepticism. More graduated with a B.A. in 1636 and remained at Cambridge to continue his studies being elected a Fellow of Christ's College in 1639. He turned his philosophical studies towards Plato, the Platonists and the Neoplatonists becoming a member of the Cambridge Platonists. ... seemed to show how to combine a scientific interest in nature with a primary concern for vindicating the reality of God and immortal human souls. However, as he studied the mechanical philosophy of Descartes he became unhappy with it. More argued that Descartes' ideas must inevitably remove God from nature and so lead to atheism. During 1648 and 1649 More and Descartes corresponded about the mechanical philosophy and this correspondence was eventually published as The Immortality of the Soule (1659). More argued that the motion of a body was an inherent property of that body, and that it was impossible for motion to be transferred from one body to another. This, of course, seems to contradict common sense for if a rolling ball strikes a ball which is at rest then the ball starts to move. More does not deny this fact which any simple experiment will verify, but he claimed that the motion of the second ball is from an internal property of its own, awakened by the impact of the first ball. ... I am the more inclined to this opinion, that there is absolutely no transfer of motions; but that a second body is as it were awakened into motion by the impact of the first body, as this or that event awakens the soul to reflection. And that the second body does not so much receive motion from the first, as put itself into motion at the bidding of the first. Why are not your vortices in the form of columns or cylinders rather than ellipses, since any point of the axis of a vortex is as it were a centre from which the celestial matter recedes with, as far as I can see, a wholly constant impetus? ... Who causes all the planets not to revolve in one plane (the plane of the ecliptic)? ... And the Moon itself, neither in the plane of the Earth's equator nor in a plane parallel to this? In all his arguments one would have to say that either More had not read the works of Galileo and Pascal, or that he had failed to understand their arguments. Certainly More puts forward arguments against the spring and weight of air which had already been answered by Pascal. More did not just use philosophical arguments against Boyle, however. He was a committed experimental scientist and he undertook a series of hydrostatic and pneumatic experiments to disprove Boyle's theory. More may have been strongly opposed to Boyle's mechanical philosophy, but he was well disposed towards the experimental philosophy of those in the Royal Society. 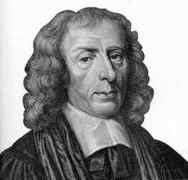 He was proposed for fellowship of the Royal Society by Wilkins on 4 June 1662 and elected on 17 September of that year. However, when the Society received its Charter from Charles II on 10 May 1663, More (and several others) were omitted from the list of Fellows. On 25 May 1664 Wilkins again proposed More for the fellowship and he was elected (for a second time) at the meeting one week later. I on the contrary when I have manifestly proved that the internal space is really distinct from matter, I conclude that it is for that reason a certain incorporeal substance or spirit, just as the Pythagoreans formerly thought. And so through that same gate through which the Cartesian philosophy seemed to intend to exclude God from the world, I on the contrary (and I am confident that success will be vouchsafed me) strive to reintroduce Him. And this infinite and immobile extension appears to be not only real but divine. One other thing about Henry More which we should discuss is his relation to Newton. Newton was born close to Grantham and attended the Free School in Grantham. In fact he had lodgings in Grantham for seven years with a Mr Clark, the brother of a teacher at the Free School. More, who was about 30 years older than Newton, often returned to his home town of Grantham and when he did so he lived with one of the two Clark brothers. Therefore when More was a major figure at Cambridge he must have got to know the young pupil Newton. We certainly know that there was contact between Newton and More up till the time More was around 70 years of age. Did More's ideas of space influence Newton? It is impossible to say with any certainty, but we can certainly note that Newton's idea of absolute space and time was crucial to his physics and that this notion of space is closely related to that put forward by More in his arguments against Descartes. Also in terms of gravity, for Descartes it was necessary to have an interaction through matter between the bodies. For Newton gravity was a force which acted through empty space and although he does not appear to have identified space with God as More did, nevertheless the spiritual aspect of space supported Newton's gravitational theories. I have measured myself from the height to the depth; and what I can do, and what I ought to do, and I do it.